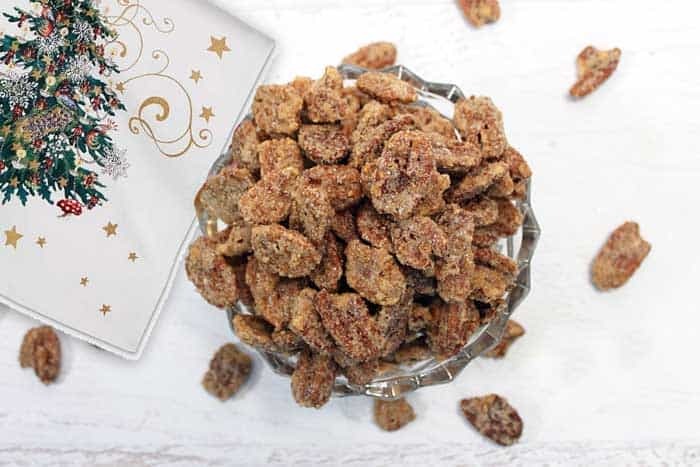 These sweet Candied Pecans are so delicious you won’t be able to stop eating them! Easy to make homemade candied pecans are cinnamon sugar-coated nuts that are baked to a sweet and crunchy finish. 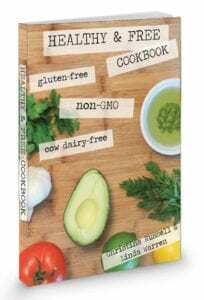 If the taste doesn’t get you the aromas coming from your kitchen will! I love making homemade gifts for Christmas to give to family and friends. 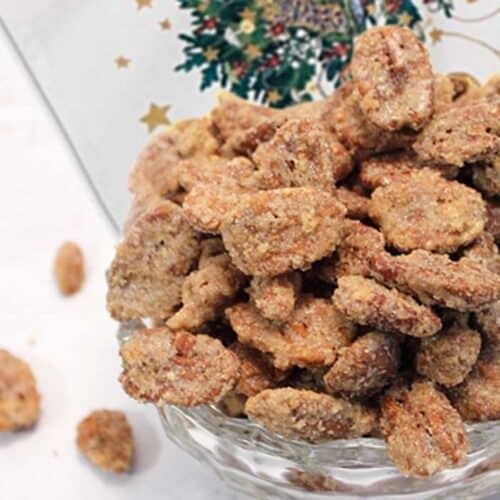 My Rosemary Olive Oil is always popular as is my Christmas Crack but these Cinnamon Sugar Candied Pecans is the one that everyone asks for year after year. 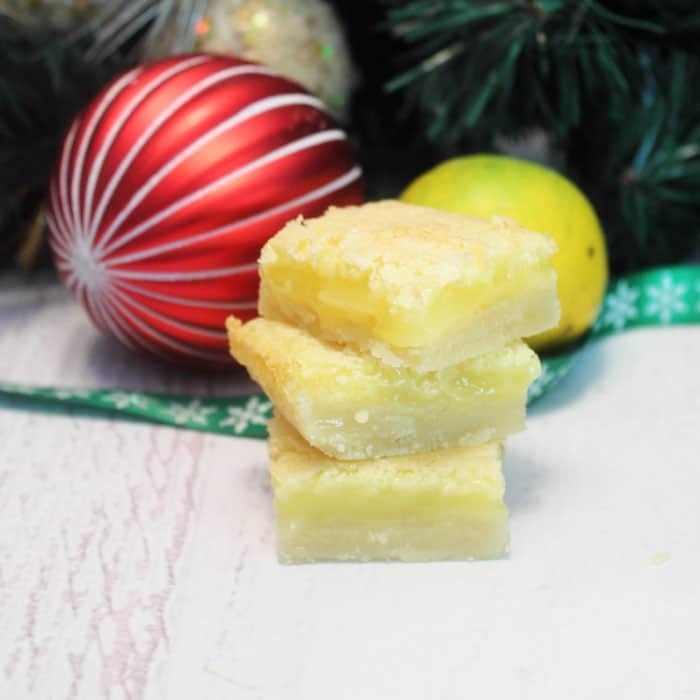 I bet you’ve smelled these baking while walking in the mall or wafting through the hall at business conventions. They always make me start salivating and definitely make me smile. Maybe it’s the sweet aroma or maybe it just brings to mind happy memories. 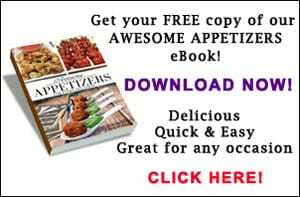 Check out the easy steps to making your new favorite snack. Beat the egg whites with a whisk til frothy. Combine sugar, cinnamon and salt in a large bowl. 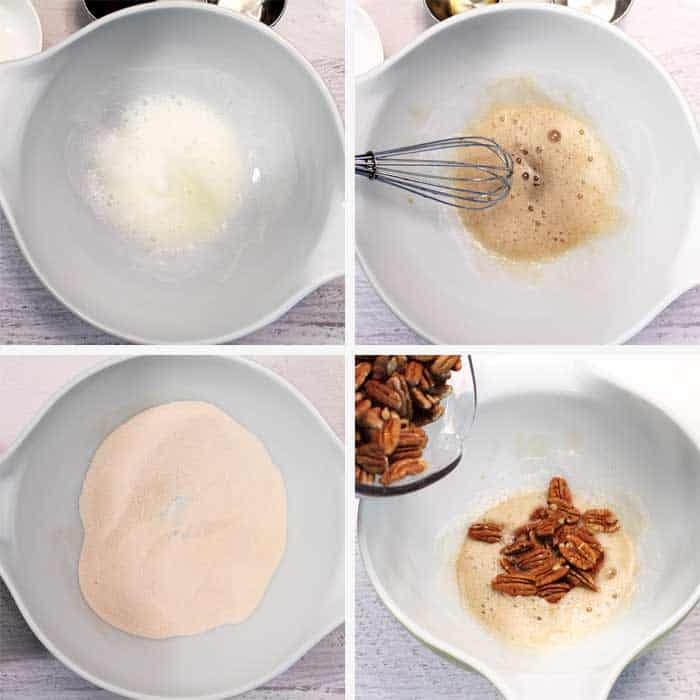 Pour pecans into whipped egg whites. Stir to make sure all pecans are well coated. Pour coated pecans into cinnamon sugar mixture. Stir again to coat each and every one. These nuts are great to package up in a jar with a ribbon around it for Christmas gifts or set out for munchies during a holiday party. And they’re not just for Christmas! 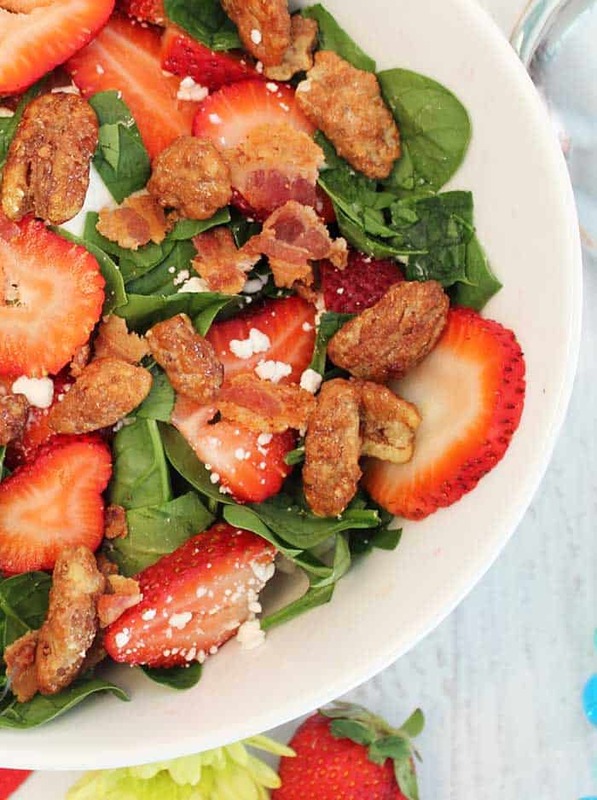 I make them all year long for snacking to as a topping for salads, like my Spinach Strawberry Goat Cheese Salad. Yum! 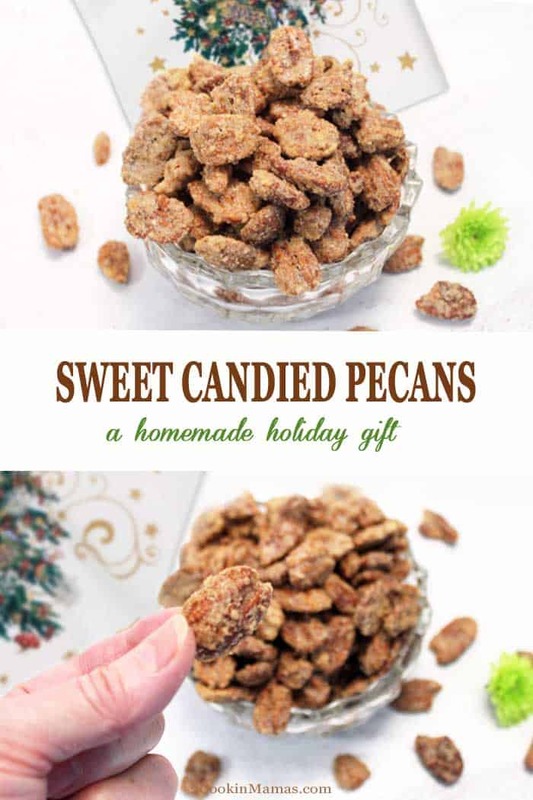 These sweet Candied Pecans are so delicious you won't be able to stop eating them! 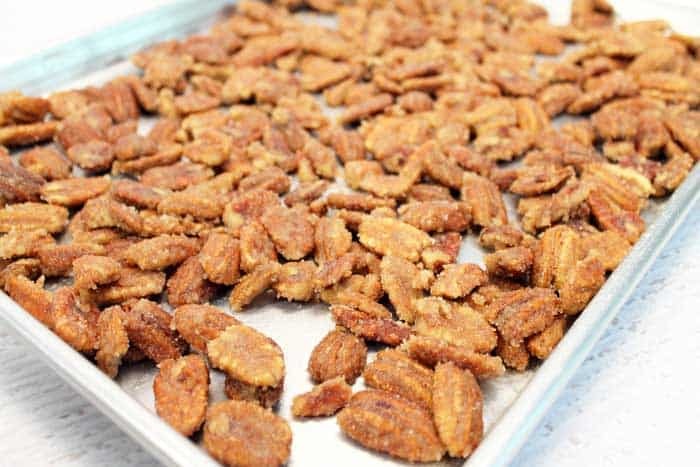 Easy to make homemade candied pecans are cinnamon sugar-coated nuts that are baked to a sweet and crunchy finish. 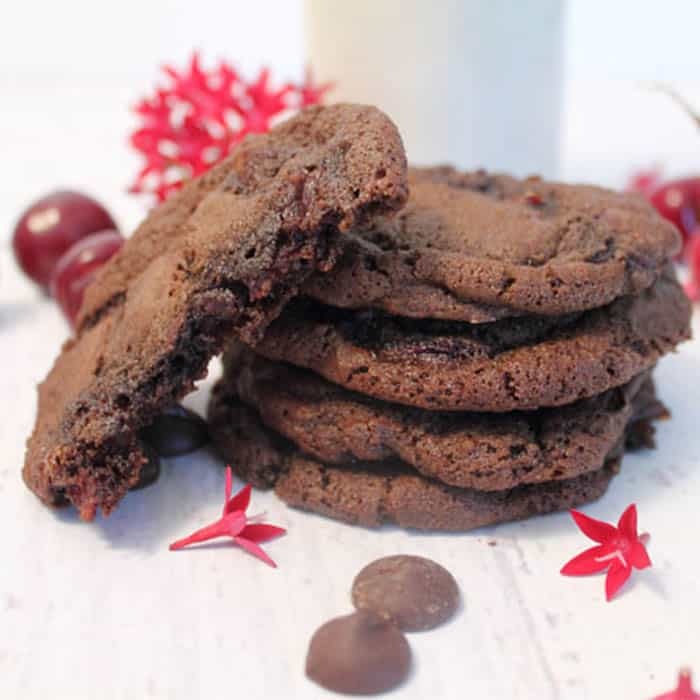 If the taste doesn't get you the aromas coming from your kitchen will! Preheat oven to 250 degrees. Prepare cookie sheet by spraying with nonstick cooking spray. 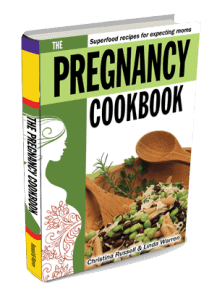 In a large mixing bowl, whip egg white and water together until frothy, stir in vanilla. In another large bowl, mix sugar, salt and cinnamon together. 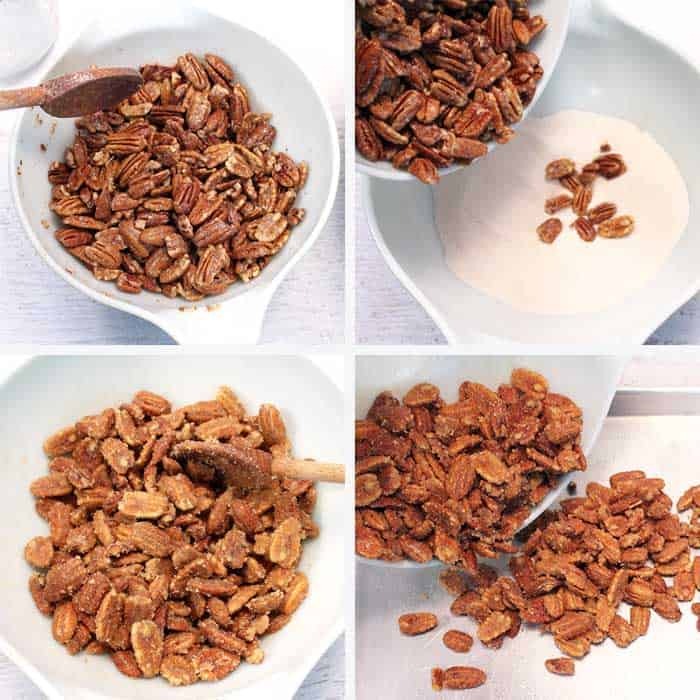 Drop pecans into egg white mixture and stir to coat. Remove pecans from egg mixture and toss into sugar/cinnamon mixture and toss to coat well. 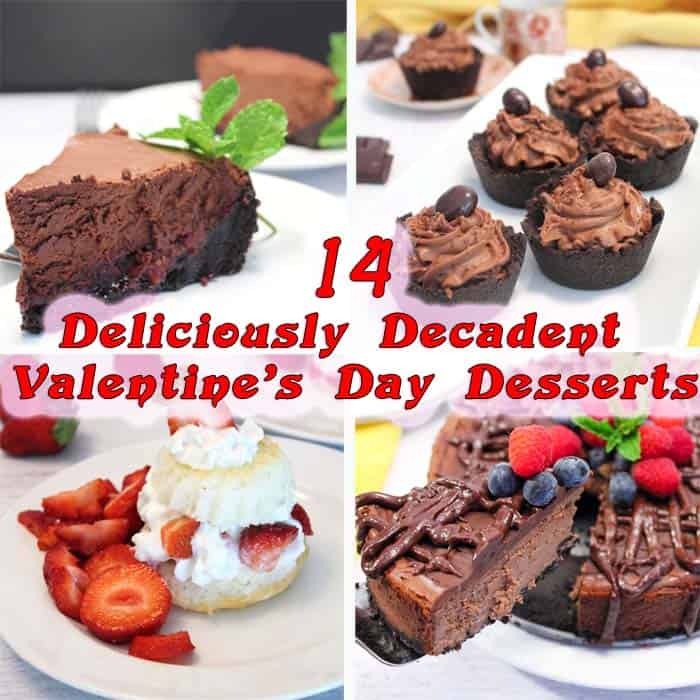 Place in a single layer on prepared cookie sheet and bake in oven for 1 hour, stirring every 15 minutes. Let cool then store in airtight container. Oh, How I love these Pecans. I eat way to many of them. Your sound and look delicious. I know just how you feel! Dangerous to have in the house but they do taste so good on a spinach, strawberry & goat cheese salad.